I’m very excited to bring Dustin Meadows, a good buddy and hilarious comic, to the Pilot Light in Old City this Wednesday night! 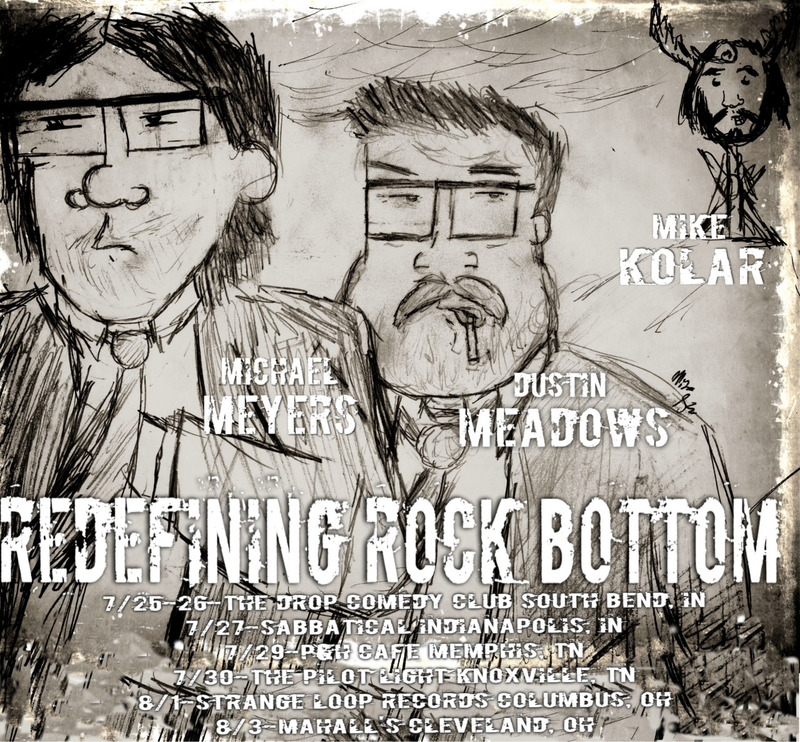 He’s coming through on his “Redefining Rock Bottom” mini-tour with Michael Meyers and Mike Kolar, two other tours-de-force from the always-explosive Columbus, OH comedy scene. For those of you who may have missed this on our respective social media, Dustin and I share a deep, unconditional love of pop-punk, best expressed by the time we wore the same Ergs! shirt to perform at Strange Loop Records in Columbus last month. Dustin blew the goddamn roof off that place, and the Pilot Light this Wednesday should be no different. He and the Mikes will have some fun merch for sale. Come on our to support local comedy and some hard-working touring comics from one of the best scenes in the Midwest! I’ll be hosting (probably) with local support for the oh-so-funny Eliot Rahal, the amped-as-all-hell J.C. Ratliff (who will be leaving for his own tour shortly after this show), and the wonderful Boston McCown (who many of you may recognize as the host of the Monday “Geeks who Drink” trivia night at Pres Pub. Also, the Sunday night open mic at Pres Pub). Please pass this along and come and hang out on Wednesday. You won’t regret it.